Iconic landmarks around the world have been lit up in the colours of the French flag as a gesture of solidarity with a nation still reeling over the devastating fire at Notre Dame Cathedral. 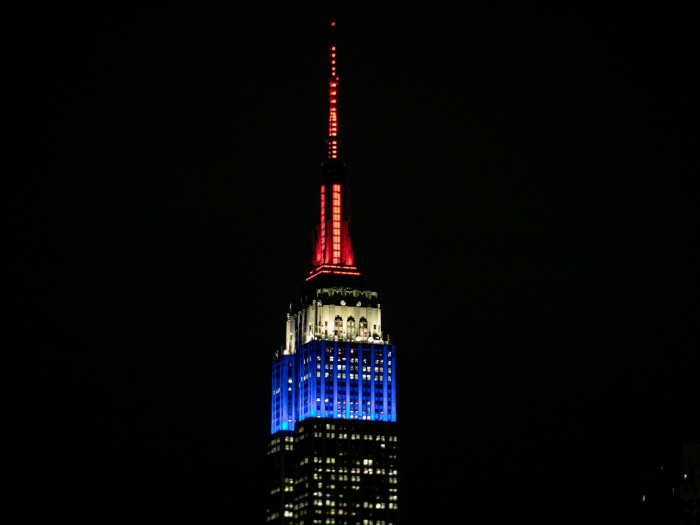 In New York City, the Empire State Building and One World Trade Centre displayed the red, white and blue as state governor Andrew M. Cuomo paid tribute to “the people of France and Catholics worldwide who are mourning this tremendous loss”. Across the US, San Francisco International Airport, the Rhode Island State House and the Seattle Great Wheel were among the structures illuminated in honour of the cathedral. In Italy, the dome of the Chapel of the Shroud in Turin and the façade of the Fenice theatre in Venice were floodlit in red, white and blue. The lookout tower on Petrin hill in the Czech capital Prague and the Stari Most bridge in the Bosnia and Herzegovina city of Mostar were also brightened with the colours of the French flag. An icon of Ottoman architecture, the bridge in Mostar was completely rebuilt in 2004 after it was destroyed by artillery fire in 1993. The bells at Westminster Abbey were rung on Tuesday afternoon to mark 24 hours since the fire broke out at Notre Dame, with Theresa May explaining it was done “to underline our solidarity with France and her people”. The French Bishops’ Conference said that the bells of all cathedrals across the country will ring out at 6:50 pm local time on Wednesday – the time when the fire started on Monday.